Igneous rocks are formed when molten rock from deep below the crust (magma) cools and solidifies. If the magma reaches the surface, it may spread out to form a lava plateau or it may erupt from a single point to form a volcano. Magma that reaches the surface and cools forms extrusive or volcanic igneous rocks and landforms. Sometimes, the magma does not reach the surface but instead remains trapped within the rocks of the Earth’s crust. Here it cools slowly to form crystalline intrusive igneous rocks such as granite and landforms such as batholiths, sills and dykes. If the magma is intruded along vertical joints, it forms dykes whereas if it moves along horizontal bedding planes, it cools to form sills. If the overlying rocks are eroded away, these features may be exposed at the surface. Sometimes, large areas of intrusive granite (called batholiths) are exposed by erosion to form moorlands such as Dartmoor in south-west England. The surface of the granite moorland may be weathered to form distinctive tor landforms. When large quantities of magma pour on to the surface through fault lines, the lava flows that result can spread over huge areas and over time this may be repeated to give a great thickness of igneous rock. Examples can be found in Northern Ireland and in the Deccan Plateau of India. There are thousands of examples of volcanoes formed when lava is extruded through a vent on to the surface. Famous examples include Mt St Helens in the USA and Mount Etna in Italy. 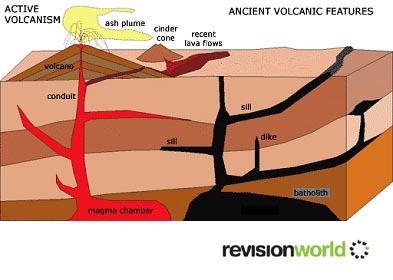 The shape of the volcano is determined by the type of lava that is extruded. Many types of igneous rocks are used as building stone, facing stone, and decorative material, such as that used for tabletops, cutting boards, and carved figures. 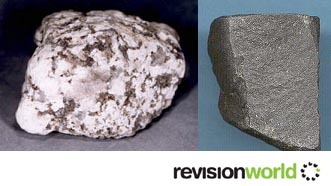 Pumice is used as an abrasive material in hand soaps, emery boards, etc. Gneiss, Schist and Gabbro are very hard and widely used as crushed stone for concrete aggregate, road surfaces and railroad ballast. Igneous rocks may also contain many important ores such tin or valuable minerals such as diamonds.